The equipment used for construction and demolition is often quite tall and can be a conductor of electricity if it gets too close to overhead power lines. As a result, the operators of these vehicles need to take precautions to stay safe from a potentially deadly on-the-job accident from electric shock. 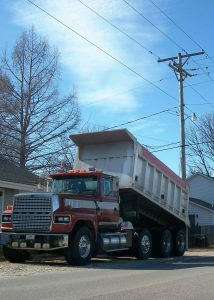 Large equipment operators need to be aware of maintaining the appropriate safety clearance distance for large equipment. Being aware of and staying safely away from overhead power lines in a work zone can help to save more lives. OSHA suggests that the clearance for some large equipment, such as cranes and derricks, be a minimum of 20 feet from overhead power lines. The equipment’s maximum working radius, 360 degrees around the equipment, must be taken into account. A dedicated spotter is very helpful when working in close proximity to overhead lines to help the operator keep the required minimum clearance. Know the clearance rules for the equipment you are operating. Use a spotter when operating large machinery near overhead lines to ensure minimum clearance is maintained. Always remember to lower extensions when moving loads. If your equipment has made contact with a power line, it is critical that you know what to do. If you don’t know the proper procedures for getting out of the cab, you could be injured or killed. It is almost always safest to stay on the equipment. Warn others to stay away, and call 911 and the local electric utility immediately. The only reason to get off the equipment is if it is on fire. If this is the case, jump off the equipment with your feet together and without touching the ground and equipment at the same time. Then, while still keeping your feet together, “bunny hop” away.